So I'm not entirely sure why I headed up the mountain on April 26th. I mean, I haven't quit coughing. Anyway, in case my Internet gets cut off again as I write this, I made it to camp 1, and it was tough. It was a long seven hours up through the ice fall. Then I had a bad Tuesday night. 8:30 PM I woke up with a headache... bad new. At midnight-thirty I went over to Sandoop and Nwang our Sherpas tent and told them I had an issue so they broke a diamox in half and gave it to me. That helped for a few hours until about 3 AM, then I more or less tossed and turned all night until it was time to get up and get going. Also, on the 26th I drank at least six liters of water, that's a lot for me, in fact, I cannot remember drinking more in a day. Perhaps during a 24 hour run, but I'm not sure. Anyway I was super strong going to camp 2 on the 27th. I did half of the ascent to camp 2 alone, because I was going fast. Then I did the whole descent to camp 1 alone. 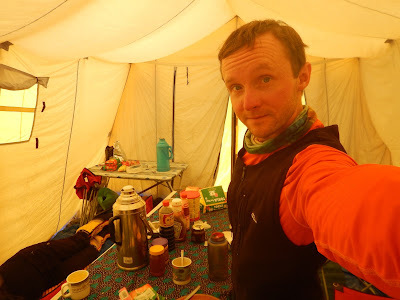 The next day I descended to camp 1 alone, almost at Sherpa speed, but not quite. Anyway, I have a terrible Internet connection, good night.